BizMojo Idaho: In-N-Out Burger -- The Next Olive Garden? While I appreciate the excitement over the news that Chick-Fil-A and Carl’s Jr. are coming to Idaho Falls, as someone who watched the buildup to Olive Garden I feel compelled to comment that these don’t really compare. Truly, is there anything that could excite people here to the degree that Olive Garden did in the three to four years before it finally arrived? The announcement was front page news. Once it was over, I felt like I did when the Beatles broke up. I believe that only one chain restaurant has what it takes to inspire a feeding frenzy of the same magnitude, and that’s In-N-Out Burger. I’ll bet some of you started salivating right now. I rest my case. Does the Irvine, Calif.-based chain have any plans to put a restaurant here? Who knows? Given my experience with chain restaurants, they never say yes or no until they’re ready to make an announcement. In-N-Out doesn’t franchise. If they do move into Idaho, my guess is they would start in the Boise area, because that’s the way it always seems to work. But I could be wrong. The company’s practices and recent history suggest that an In-N-Out here is at least possible if not inevitable. They don’t build restaurants more than a day’s drive from one of their distribution centers, and they have one in Draper, Utah. Indeed, after opening in St. George in 2008, eight In-N-Outs subsequently popped up in the Salt Lake Valley. I know what you’re thinking: “This is just a tease.” You’re right, but we all need some excitement, don't we? 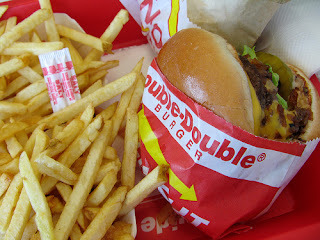 Mmmm ... a mouth-watering Double-Double and fries from In-N-Out Burger.